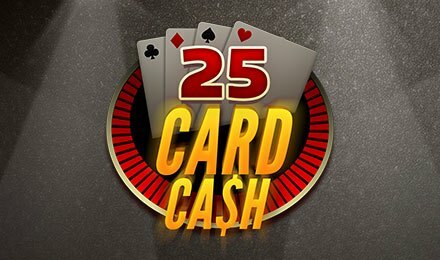 If you’re looking for a fast-paced game and wins to pocket quickly, 25 Card Cash is just for you. You can now play this game at Wicked Jackpots and enjoy the perks on this IWG game. Classic card symbols are found on a dark background, making it as classy as possible. This slot game is a 5-reel and 5 row grids, where you can find all the game options on either right or left of the screen. When the game is launched, you will face 25 different cards on the grid. After placing your bets, click on the cards to reveal various symbols. Your role on this game is to match three similar symbols for a win. Bet Levels: No bet levels present in this game. Amount of Lines Selection: This arcade game does not include any paylines. Coin Values: Toggle the Bet Field button to adjust your bets by using the + or – buttons. The Golden Card on 25 Card Cash takes you to the bonus table once revealed. Once you’ve moved onto the next screen, you’ll face a Prize Wheel where one free spin on that current wheel is awarded! Win amazing prizes from this bonus round!